"The next oldest living native of Swaledale is, I believe, Widow Nancy Harker, who was born at Muker, October 6th, 1800. 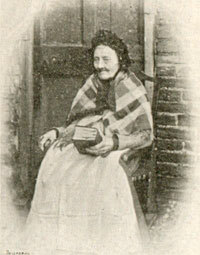 She was a daughter of Henry Spensley, of Muker, and was married at Muker to James Harker, of Whitaside, in 1832. She has had a family of four sons and a daughter, and has been a widow since 1850, and now resides at Ripon. She is a hale and hearty body (of medium height and fair complexion), who rises every morning at seven o'clock, makes her own breakfast, and busies herself about the house until dinner time, when in the afternoon she sits and sews. *Since the above was written I regret I have to record the death of this wonderful old body, who had never a day's illness up to within two days of her death. She was busily baking her bread, when probably from over exertion she became indisposed, and taking to her bed, died suddenly the following day, March 2nd, 1896, in the 96th year of her age. The portrait was taken only a few months before her death."